Amazing roof top pool. Incredible staff. Gorgeous restaurant. Perfect! Perfect! Perfect! Great location and easy access to the rooms. Great price and real easy going. Where to find Lagos hotels near an airport? How can I find hotels in different Lagos neighborhoods? Where can I find hotels in Lagos that are near tourist attractions? 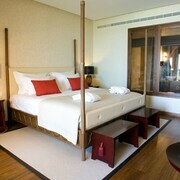 Visitors can discover a terrific range of accommodation options to select from in Lagos. You will find no less than 95 places to base yourself within a 0.1-kilometre (0.06-mile) radius of Lagos' downtown in Expedia's handy booking section. Smart travelers who appreciate the many benefits of basing themselves close to the bright lights and action of the city's heart will love the Marina Club Suite Hotel and Aqualuz Suite Hotel Apartamentos Lagos, which are located within a 1-kilometre (0.6-mile) radius of Lagos' center. Of course, a trip to Lagos wouldn't be complete without a visit to the Meia Praia Beach. The Vivenda Miranda and Cascade Wellness & Lifestyle Resort, are within strolling distance from Meia Praia Beach. The Dona Ana Beach and the Luz Beach are popular Lagos, attractions and many visitors choose to stay nearby. The Apartamentos Turisticos Buganvilia and the Yellow Lagos Meia Praia - Adults Only are amongst the hotels that are nearby to the Dona Ana Beach. 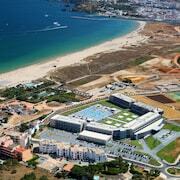 The Vila Valverde Design Country Hotel and the Palm Bay Apartments are near the Luz Beach. If you're traveling on a tight budget, you'll be delighted to discover that there is a healthy range of cheap and cheerful hotels and apartments in Lagos. The Flow House is 1 kilometre (1 mile) from downtown, while the Tivoli Lagos is 0.5 kilometres (0.3 miles) away. 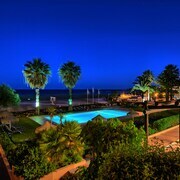 Other budget room options include the Carvi Beach Hotel and the Aparthotel Vila Luz. 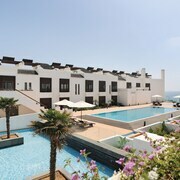 The Martinhal Beach Resort & Hotel is situated 25 kilometres (15 miles) from the central part of Lagos. 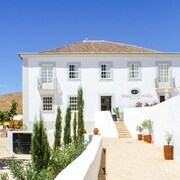 Alternatively, the Bela Vista Hotel & Spa - Adults Only is located 12 kilometres (8 miles) away. The Quinta da Floresta Golf & Leisure Holiday Resort and also the Pestana Golf & Resorts are some alternative places to stay in Lagos. Looking for more to do? Why not spend some time enjoying Falesia Beach and Vilamoura Marina, in Vilamoura, 50 kilometres (31 miles) to the east of Lagos. 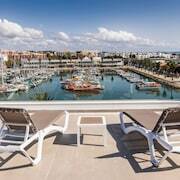 The As Cascatas Golf Resort & Spa and The Lake Resort are just some of the Expedia-listed accommodation alternatives in Vilamoura. 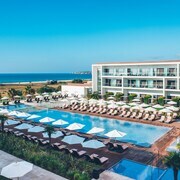 Or, you could stay in Armacao de Pera, 25 kilometres (17 miles) to the east of Lagos, where you'll find the Vila Vita Parc Resort & Spa and Vilalara Thalassa Resort. Regardless of whether you're passing through or spending a few nights in Armacao de Pera, a couple of sights worth adding to your itinerary are the Cova Redonda Beach and Trilhos do Algarve. Situated 65 kilometres (39 miles) from Lagos is Faro International Airport. 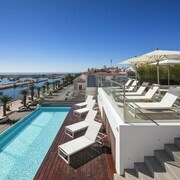 Stay nearby at Hotel Eva or Hotel Faro. What are the most popular Lagos hotels? Are there hotels in other cities near Lagos? What other types of accommodations are available in Lagos? Explore Lagos with Expedia.ca’s Travel Guides to find the best flights, cars, holiday packages and more!